What is Main Event – ALL IN? 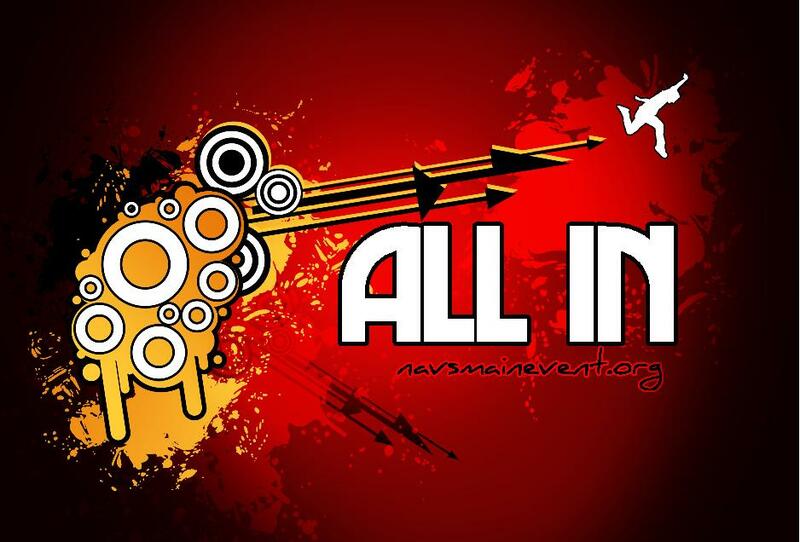 Main Event – ALL IN is a conference near the beginning of the fall for Navigators ministries in the midwest. It is a time for 700 students to gather together to learn how to follow Jesus, to get connected with other students from their campus, and to have a really fun time. There is large group teaching and this year Tom Yeakley will be speaking. There is also breakout workshops on Saturday afternoon where students get to hear from pastors and Navigator Reps on different topics of their choosing. They are also placed in small groups where they have time to process through and discuss with other students what God is teaching them in these settings. One of the coolest things about the conference takes place Saturday night, where the small groups go out into the community to “Host Homes“. They have a meal with the family hosting and get to hear how God is leading the family and share testimonies. This is one of the most important things we do with The Navigators in getting students further connected with our ministry and to Jesus Christ. Every year there are students who look back at this weekend as a turning point in their walk with Christ in college!